Since our last article: Claim your Italian inheritance...before it's too late, the stories of financial intrigue and general administrative bungling that reached our attention could serve as fodder for several hit movies. The recurring theme running through most of the emails and telephone calls received allows one to conclude that misinformation and false assumptions are made by many of those of Italian decent. Mistakenly, they believe that Italian law follows the "same rules" as those of their home country and that, for example, if you are named in a will you inherit something, and if not named, you get nothing. This common belief is generally the crux of the matter and the reason inheritances are lost or go unclaimed! Getting back to our real life movies, let me say that the plots that unfold generally fall into two categories: you inherited the castle in Sicily from a deceased relative and did nothing more or you did not know that you had the right to inherit that "castle on the hill" and therefore were ignorant of the fact. The following real life tales illustrate how you may lose the family property in Italy. Would you prefer to inherit 14% or 50%? Lucy receives word that she has inherited 14% of her father's properties in Italy. She is joyous and signs documents accepting the unexpected windfall. Not long after, she is overcome by tears discovering that she had the right to 50% of her father's estate. That's because her mother should have inherited the remaining 50% (see the diagram below). 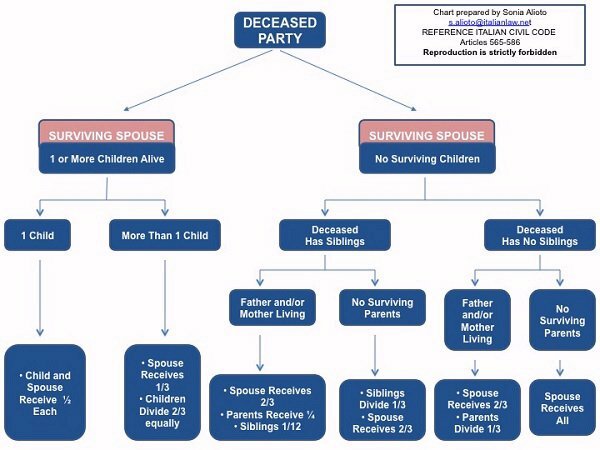 Are you included in the inheritance at all? Answer: Only if you are alive! Paolo, residing in the U.S. writes to his relatives in Italy, whom he has not seen for a number of years, and tells them that he will be visiting soon. His deceased father had been a co-owner of several pieces of property in the town. When he arrives in Italy, everyone is "out of town" or busy. He is unsettled by this fact and some months later sends his personal "Inspector Colombo" to the scene. The inspector uncovers documents in which four of his relatives had sworn in an affidavit, before an Italian judge, that Paolo's father had no children. How could this be? "My father had two children, my sister and I!" he said. Apparently the slices of "property pie" are much larger when divided into four parts as opposed to six. If you find yourself in the same situation, what should you do to recover your share? You should file documents in Italy called "Declaration of Succession" in which you declare your existence as quickly as possible! How many of my readers are aware of the specifics of the property held by the family in Italy? I would venture few. How many are aware that the property title has perhaps gone unchanged for decades or conveyed illegally to others? How many believe that the instructions in a will must be followed according to the wishes of the deceased? We will leave the answer to this last question for the next article or future movie of intrigue. 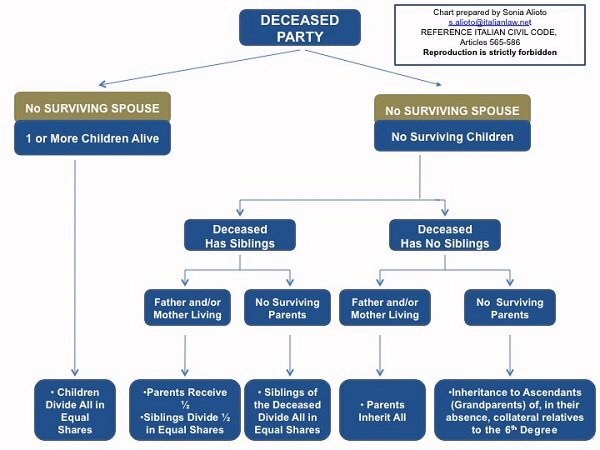 For the time being, the moral of the story: family members residing outside of Italy may be included automatically in the estate so be sure not to sign anything too haistily and don't be afraid to declare your own existance.